Third Party hardware developers PDP have had a great track record when it comes to providing cool looking Videogame controllers. They have been supporting Nintendo for quite a while and the Nintendo Switch is no exception. With more variants including both wired and wireless options and with plenty of designs to choose from including but not limited to; Mario, Zelda and Pokémon. There is literally a PDP Switch controller to match almost everyone’s tastes. Well, PDP are not done yet and have probably excelled themselves this time as they are releasing a new controller with integrated In-Game Chat and Game Audio. This new controller is the PDP Faceoff Deluxe+ Audio Wired Controller. This new controller is built for games like Fortnite on Nintendo Switch but I wouldn’t be surprised if Nintendo decided to integrate the controller to work with games like Splatoon 2. April 3, 2019 San Diego, CA – PDP has created the first Nintendo Switch controller with integrated in-game chat and game audio called the Faceoff Deluxe+ Audio Wired Controller. With the recent announcement of communications expert, Vivox, providing the development tools used to create true in-game chat with Fortnite on the Nintendo Switch, the timing is perfect for this new innovative controller. 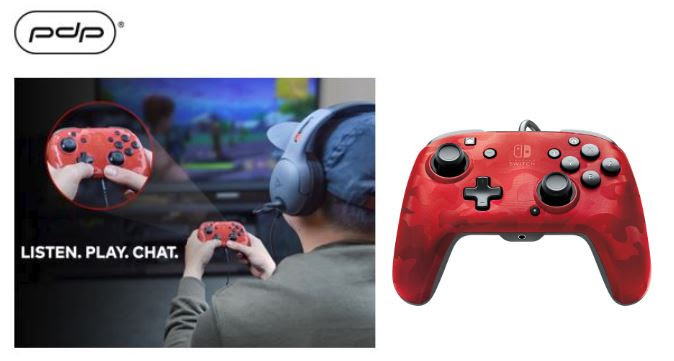 Launching Summer 2019, the new controller features support for Vivox’s integrated in-game chat, premium game audio through a 3.5mm audio jack, patented on-board audio controls that let you adjust the audio on the fly right from your controller, two additional programmable buttons, and an interchangeable faceplate – making it the best Nintendo Switch controller for serious gamers. Pre-orders begin this May on PDP.com and at participating retailers. PDP has long been committed to providing high-quality gaming controllers, collectibles, and gear so players can live their best gaming lives. The new Faceoff Deluxe+ Audio Wired Controller will offer smooth and responsive performance, durable construction, enhanced customization options, plus unmatched audio and in-game chat – making elite gaming available to every Nintendo Switch player.